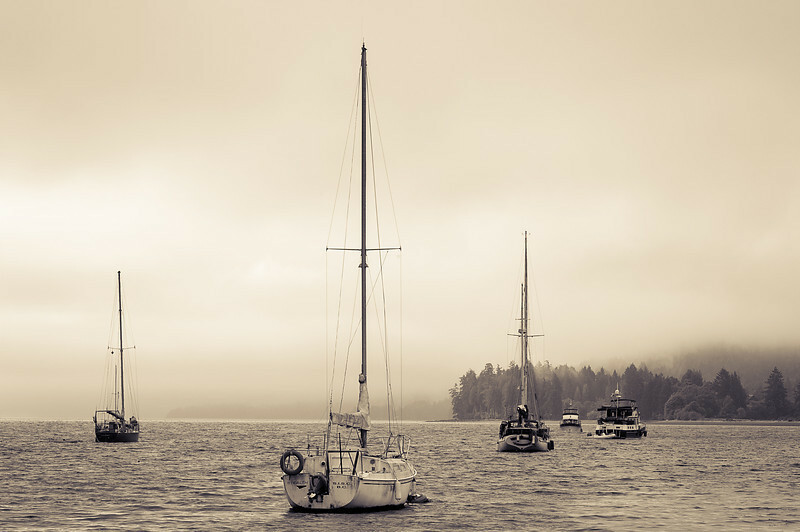 I recently (May '12) spent a week on Salt Spring Island, British Columbia for a Three Principles workshop. The entire time the weather was cloudy and overcast, but amazingly I enjoyed the effect on the mood. I had a feeling of being closed in by the clouds protected from the outside world. Even though clouds and coolness often give one a cold and gloomy feel I felt a warm protection. I was there to learn about living a more happy, forgiving and loving lifestyle. The information I received was delivered in a gentle and calm manner with no bright lights and noise. Accordingly I felt the lack of color and brightness of the sun reflected my feelings about receiving this information. No squinting was necessary to protect my senses. To relax and receive the information with comfort and ease was reflected in the enviornment. During my last evening on the island I experienced the clouds slightly breaking open and sun rays shone enlightenment on my sole as reflected in the last two photographs. What a blessed experience. I hope you can feel what I experienced through these photographs.